Note: the little Vetterli M1878 rifle icons on the right ( ) are permalinks; the URL to which they point can be used to access or revisit specific parts of this admittedly long page. Serial number 53XX, this rifle was built in late 1894 or early 1895. The receiver is dated 1894, and the cartouche on the stock says 1895 (inspector's initials JSA, for J. S. Adams). The rifle was issued to Private John J. Maly when he joined the 1st Illinois Infantry (Company H) on April 26, 1898. It was carried by Maly in Cuba during the Spanish American War, and he brought it home with him when he mustered out of the Army on November 17, 1898. He had the rifle's stock and barrel shortened for deer hunting, and added a Lyman bead front sight. The rifle was last fired in the 1930's by his nephew Frank during a deer hunt. The original springs have been taken out and set aside so the action can be worked without risking damage to 110+ year old spring steel. Since this rifle left Army inventory at the close of the war, it was not converted to the Model 1896 pattern as were most Model 1892s. As a result, aside from the sporterization (and the upper band, which is a replacement) the rifle parts are in all-original 1st Pattern configuration down to the pre-February 1895 polished main spring and the original Model 1892 extractor. Note the very thin stock wrist and sharp (non-rounded) toe of the buttstock; these are some of the most visible 1st Pattern features. Found to be too fragile, most Krags were upgraded to the more robust Model 1896 stock. Another interesting feature of this rifle is the 1st Pattern magazine cutoff, which engages in the opposite direction of later Krag rifles (it is "OFF" when up). The magazine cutoff has four grooves, indicating manufacture in the second half of 1894. The rifle's one Model 1896 part is its rear sight, which was upgraded to said pattern in June, 1896 to compensate for an ammunition change introduced by the Frankford Arsenal in August 1895. According to Brophy, 24,562 Model 1892 rifles were manufactured. 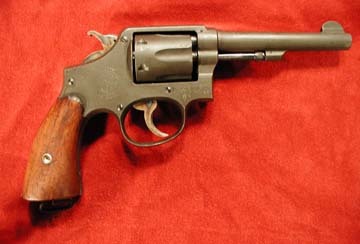 Of these, 18,559 were later converted to the Model 1896 pattern. This left about 6,000 unmodified Model 1892 pattern rifles at the end of fiscal year 1902, many of which have since been lost, destroyed in service, or scrapped. It is unfortunate that this rifle has been sporterized, and some of its parts lost; its ramrod channel sits empty, the original ramrod gone forever. However, I believe this is more than made up for by the fact that its provenance is nearly 100% known, a characteristic as rare among old military rifles as this Model 1892 is among other Model 1892s. Serial number 815XX, this rifle was manufactured at the Rock Island Arsenal in 1907. After a decade of use and abuse (potentially including combat in such military actions as the hunt for Poncho Villa, and various uprisings and peacekeeping expeditions in Central America and the Carribean), it was rebuilt with a new Springfield Arsenal barrel during World War I, and thus has an SA 5-17 (May, 1917) marking on the barrel. During World War II, Congress passed the Lend-Lease Act, and many 1903, 1903A3, and M1 Garand rifles were sent to (among other places) Greece. This specimen is one of those 1903 rifles. At some point during or after World War II, a Greek arsenal reblued this rifle to a nearly black color, and electropencilled the last four digits of the serial number onto the bolt. This rifle was brought back to the United States by the Civilian Marksmanship Program in late 2001 or early 2002, and thus has no import marks. 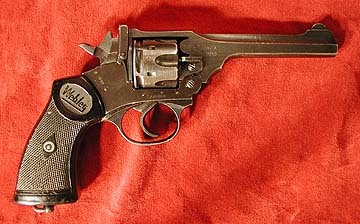 The bolt is a 1903A3 pattern, indicating arsenal replacement at some point. Serial number 7090XX, this rifle was manufactured by Eddystone in June 1918 and has its original E / 6-18 (June 1918) marked barrel. The Eddystone plant was part of Baldwin Locomotive Works' contribution to the war effort. This is a non-reworked example with blued finish. There are British proofs on receiver and bolt-handle, indicating that this was a lend-lease rifle (probably during its second life in World War II). The deeper British stampings were covered with the green coating commonly seen on Enfield bolt-action rifles. The wood is a streaked walnut. This rifle was supposedly purchased from the DCM during the mid-1960's (included U.S. Army manual and generic letter from DCM). The only negative about this rifle is that the high-points of "ears" protecting rear-sight were ground-down a bit, probably so a scope could be affixed. Not import-marked. Contrary to popular belief, the US Model of 1917 was more widely used by US troops in World War I than the Springfield 1903. This was largely the result of its simple design, which allowed quick manufacture. The rifles were subsequently issued to US reserve forces and used for training in World War II. They were also given to British Home Guard units, which may help to explain both the good condition of, and British markings on, this particular rifle. Alvin York used a US Model of 1917 rifle when he earned his Medal of Honor. Serial number 37843XX, this rifle was manufactured by Remington in 1943 (the date on the still-original barrel is May 1943). After apparently little use by the United States, it was sent (along with many other 1903A3, 1903, and M1 Garand rifles) to Greece as part of the Lend-Lease program. At some point during or after World War II, a Greek arsenal stamped the buttstock and electropencilled the bolt with the last four digits of the serial number. The rifle retains its original parkerized finish and is still in excellent condition, indicating little use by the Greek military. This rifle was brought back to the United States by the Civilian Marksmanship Program in late 2001 or early 2002, and thus has no import marks. Note the &qot;C" stock, characterized by the presence of a pistol grip. Serial number 32872XX, this rifle was manufactured at the Springfield Arsenal in November of 1944. After almost a decade of use and abuse (potentially including action in World War II and/or the Korean War) the rifle was rebuilt at the Red River Arsenal in 1953. The barrel was made in February, 1953 by the Line Material Company (marked "LMR") of Birmingham, Alabama, who manufactured the barrels for M1 Garands made by International Harvester (the truck and tractor manufacturer). LMR barrels are reputedly among the best quality Garand barrels ever made. Called "the greatest battle implement ever devised" by General Patton, over 4,000,000 Garand rifles were made between 1936 and 1957. The M1 Garand served the United States in World War II, Korea, and several other, smaller police actions. 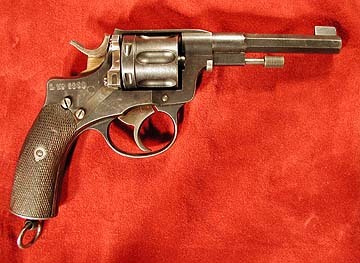 This revolver (serial number V3163XX) was manufactured by Smith & Wesson in 1943. The topstrap is marked "U.S. PROPERTY G.H.D." The rainbow case coloring is still present on the trigger and hammer, and results from the hardening process used on these parts. Soon after manufacture, the revolver went to Australia as part of the Lend-Lease program. The revolver is marked "FTR\MA 54" indicating that it was rebuilt (Factory Thorough Reconditioned) at Munitions Australia (Lithgow)in 1954. The V serial number prefix indicates wartime manufacture. Note that some Victory models also have an S prefix or postfix, indicating retrofit with a hammer safety block in 1945. This change was ordered after a sailor died from an accidental discharge caused by a revolver that fell quite a distance onto a ship's deck. Serial number 60XXZ, this rifle (a.k.a. the Osterreichisches Repetier-Stutzen M.95, a.k.a. the Extra-Korps-Gewehr M.95) has a "W-n 20" marking, indicating it was manufactured by Steyr in 1920. The serial number is the second-latest known for these rifles (latest known is 7198Z), making it one of the final weapons built by the post-WWI remnants of the Austro-Hungarian Empire; the 1919 Treaty of St. Germain limited production at Steyr to small numbers of weapons for newly formed local army and police units. It has a Czechoslovakian property marking ("S [lion] 10", indicating it was used in the Banska Bystrica military district), and was probably made specifically for service in Czechoslovakia. The rifle began life as a stutzen with sling swivels on both the side and bottom to accomodate both infantry (who used the bottom swivels) and mounted cavalry (who used the side swivels). The rifle was later converted from 8x50R (M.93) to the more powerful 8x56R (M.30) caliber in the mid 1930's. A taller front sight was added to the still-original stutzen dovetailed sight base to compensate for this change, while the rear sight markings were ground off and markings calibrated to the new round were added. Additionally, the sling swivels were removed: the front swivel would have been hinged into the barrel band, and was replaced with a spacer, while the rear swivel was removed and its hole plugged with two types of wood (will post a close-up photo soon). More than three million of these rifles were made between 1895 and 1920. An unusual feature of the design is that the clip is fed into the top of the receiver, where it remains. Once the last round is fired, the clip is ejected out the bottom of the action. The rifle has all-matching stamped numbers and a great bore. The buttstock was apparently made from a beautiful piece of the now-extinct Circassian walnut. 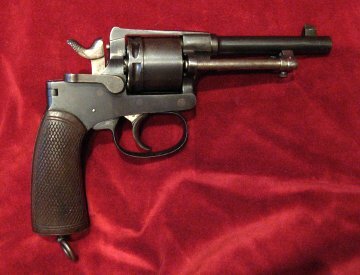 Serial number 1368XX, this 8-shot revolver (also known as the Infanterierevolver M.98) was manufactured by Rast & Gasser of Ottakring, Vienna circa 1916. It has an "ML" marking on it, indicating a cylinder and barrel made from molybdan legierung (a molybdenum alloy). The revolver has an Austro-Hungarian "Wn" army acceptance stamp and date on the topstrap. 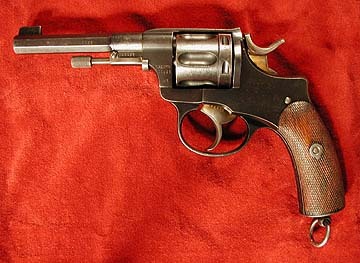 Between 200,000 and 250,000 M1898 revolvers were made between 1898 and 1938. They were used by the Austrian army until the latter date, when they were issued to the Austrian Heimatdienst. Many were also used by Italian troops in North Africa during World War II. This CZ vz. 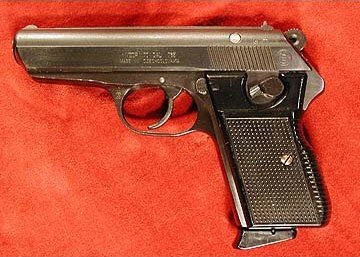 24 pistol (serial number 112XXX) was manufactured in 1931 at the Strakonice CZ factory and has Czech acceptance markings on the receiver and barrel. 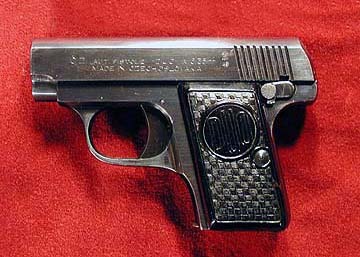 The pistol has a ČET marking on the right side of the receiver, indicating use by the Czechoslovakian Cetnictvo (Gendarmarie) beginning in 1934. The gun is also marked with an uncircled "T" stamp on the left side of the receiver, possibly indicating German military use (an uncircled "T" was often used to indicate the German word "Tschechisch" (Czech).&nsp; This pistol is not import marked, with all matching numbers except for aftermarket magazine. The vz. 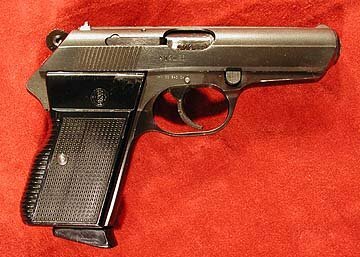 27 pistol was manufactured from 1927 until 1947. Between 620,000 and 650,000 were manufactured in total, 452,500 of those under German occupation. Known military contracts include India, Brazil, Ecuador, Bolivia, Venezuela, and Poland. An additional contract for 7,000 vz. 27 pistols may have gone to Israel, but this cannot be confirmed; due to contempt for Israel's "Zionism" from hardline Communists, records of such a sale, if they ever existed, were quickly hidden or destroyed. As on many other occasions, the post-war political climate had a strong influence on CZ exports. 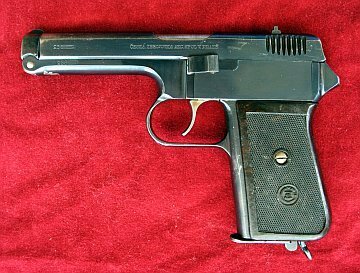 Interestingly, in December of 1948, a gift of five "ČZ 247" automatic variants of the pistol (based on both the vz. 24 and vz. 27) was sent to Ethopian ruler Haile Selassie. In 1949, the vz. pistol was exported to 28 countries, including Turkey (3,286 pistols), England, South Africa, Egypt, Kenya, and Pakistan. The vz. 27 was also used domestically. In 1946, 45,000 vz. 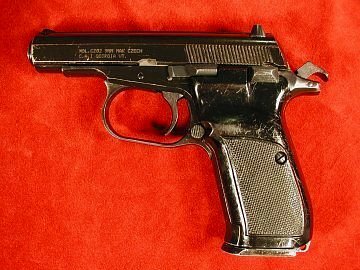 27 pistols were made for the Czechoslovakian MNO (Ministry of National Defense) to be used by the SNB (Sbor Narodni Bezpecnosti, or National Security Corps). The serial number of this piece (477XXX) places it in the 5,000 or so CZ vz. 27's that were assembled from parts made under Nazi occupation just after the war ended in 1945. Thus, the black, unmarked grips (with no manufacturer's marking) and "fnh" (Nazi factory code) making on the slide slide, but no Nazi proofs. Despite this, the finish is quite nice, except for the outside of the barrel (which has circumferential milling marks). The finish is a high-polish blue, with straw color on the trigger, extractor and hammer. All-matching numbers, not import-marked. 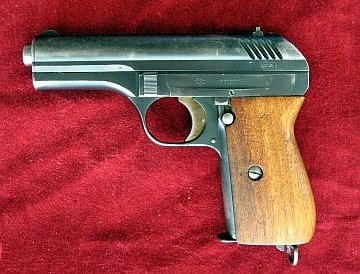 This double-action-only (DAO) pistol was built in September 1939 (serial number 2588XX) at the Strakonice CZ factory and has Czech acceptance markings on the slide and barrel. 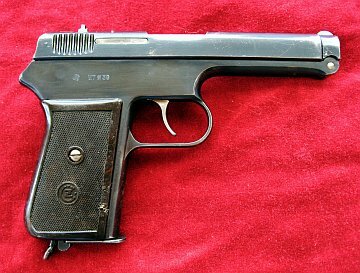 Shortly after the pistol was tested by the Ministry of National Defense, but before mass production could begin, Germany invaded Czechoslovakia and captured the factory. 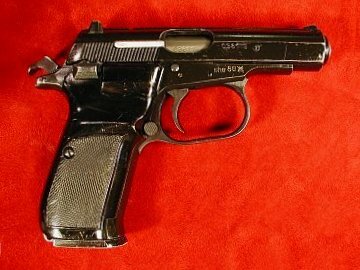 CZ vzor 38 production was allowed to continue, and the resulting firearms were used during World War II by the German Wehrmacht, Reich Labor Service (Reichsarbeitsdienst) units, in the work Organization Todt, and also to a limited extent by the German Air Force (Luftwaffe). A special group of 3,000 pistols was made for use by the Luftwaffe. Known contracts include 1,731 standard (DAO) configuration vz. 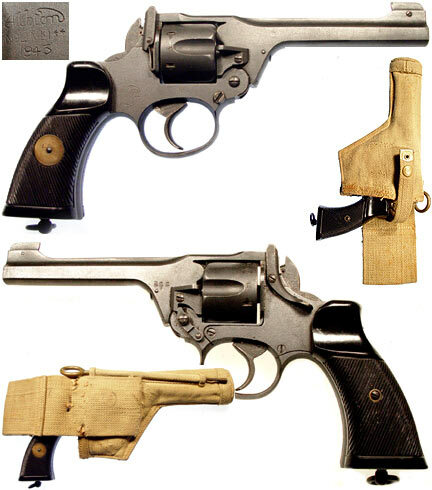 38 pistols sold to the Finnish Army, and 1,000 single action/double action (SA/DA) pistols specially equipped with a safety lever which were eventually sold to Bulgaria. This unusual design was one of the earliest double-action-only pistols, and served as the prototype for the modern semiautomatic pistol. 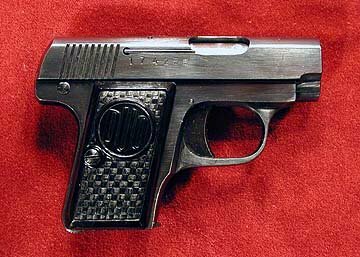 Only 41,000 of these pistols were produced, although the 3,000 Luftwaffe and the 1,000 Bulgarian pistols can probably be added to this figure given their separate serial number blocks. This specimen has matching slide, frame, and lockplate, and has no import markings. For more information on the Czech vz. 38 pistol, click here! This pistol was built in 1948 (serial number 945XX) at the Strakonice CZ factory and has Czech acceptance markings on the slide and barrel. 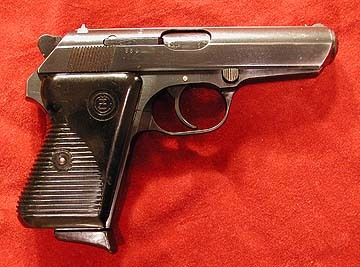 The vzor 45 was based on the earlier vzor 36 pistol. Although designed for civilian use, the vz. 45 pistol was also used by officers in the military, officers of the SNB (Sbor Narodni Bezpecnosti, or National Security Corps), members of CSD (Ceskoslovenske Statni Drahy, or Czechoslovakian State Railways) security, and members of the Transportation Service Police (a division of Czechoslovakia Public Security (VB), the uniformed branch of police). For more information on the Czech vz. 45 pistol, click here! Frantiek Duek ran the largest private gun factory in Czechoslovakia before World War II. Based in Opočno in northeastern Bohemia, Duek achieved a high degree of vertical integration in order to minimize dependence on other companies. When Germany invaded Czechoslovakia, Duek refused to cooperate with them, and the factory operated without him for the remainder of World War II. In 1948-1949, the Czechoslovakian government nationalized (a.k.a. stole) Duek's company. This particular Duo pistol (one of the higher quality descendants of the Browning Model 1906) was manufactured in 1949, during this crossover period. 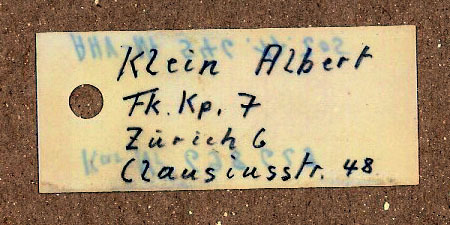 Note the "ČZ" stamp in a different font and strike depth than the surrounding text, yet the "Duo" name is still present in several places on this pistol. 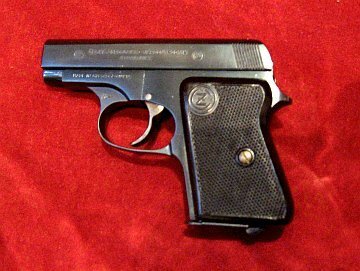 Within a few years, the government had changed the name of the pistol to the "Model Z," thus distancing the operation from its creator. The nationalized factory was also used to make CZ vz. 45 pistols. 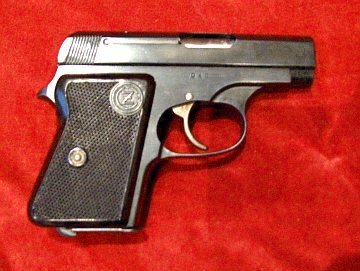 The Duo and Model Z pistols were preferred by members of the Transportation Service Police (a division of Czechoslovakia Public Security (VB), the uniformed branch of police), who often carried them as personal sidearms while on duty. Manufactured in 1950 (serial number 669,1XX), this was one of the first 20,000 vz. 50 pistols made (vz. 50 serial numbers began where vz. 27 serial numbers left off; thus, the first vz. 50 pistol made was serial number 650,001). The "NB50" marking on the grip strap is a property marking used by Narodni Bezpečnosti (literally, National Security), the Czechoslovakian police corp.
NB was comprised of two branches. Public Security was a uniformed force that performed routine police duties throughout the country. In contrast, State Security was both an investigative agency, and an intelligence/counter intelligence agency. Activities considered to be anti-state fell under the purview of State Security. State Security (a.k.a. Secret Police) were notorious for their cruelty and brutality. NB was an armed force, organized and trained as such, but equipped to perform police rather than military functions. For whatever reason, only early 1950's vz. 50 pistols are NB-marked. The 50 denotes 1950; NB51 and NB52 markings have also been seen. Note the magazine floorplate, made of brown bakelite and curving distinctly downward. Very few of these original vz. 50 magazines seem to exist. The author has only ever encountered this one in the last decade; presumably, most were discarded and replaced with (interchangable) vz. 70 magazines (as seen below) during the decades following 1970. Manufactured 1977 (serial number 4031XX). Note that many CZ 70's started out as CZ 50's (check the serial number/date to be sure), while others were manufactured new. All matching numbers; Import-marked. Slide: The 50 has a shorter serrated region on the slide comprised of 14 serrations, whereas the 70 has 16 serrations spread out more widely. Grips: 50 has brown, lined grips, whereas the 70 has black checkered. Takedown button: The 50 is serrated, whereas the 70 is checkered. Trigger: The 50 is smooth, whereas the 70 is serrated. Hammer: The 50 is solid, whereas the 70 has a hole to reduce weight. Magazine: Different floorplate contour and color. See above. Safety switch: There appears to be a subtle difference between the contours and lengths of the safety switch between the two models. The left side of the slide is marked "rid", indicating manufacture for the military at the Strakonice CZ factory. The crossed swords military acceptance mark also appears on the receiver. Production of vz. 52 pistols ended in 1954, and in 1955 the Strakonice factory went back to manufacturing motorcycles. 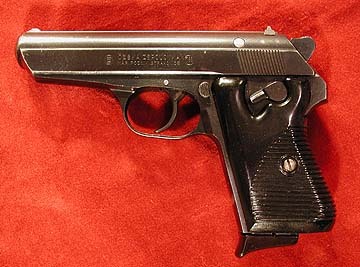 This pistol was built in 1986 (serial number 0381XX) at Uhersky Brod (indicated by a "she" factory marking). For more photos of, and information about, this pistol click here! Manufactured in 1959, this rifle (serial number JO384XX) is marked with the letters "she" indicating manufacture by the Czech Arms Factory in Uhersky Brod, and a pair of crossed swords (the Czechoslovakian military acceptance mark). The vz. 52/57 was used in Czechoslovakia, and later given to such nations as Egypt (when Colonel Naguib was deposed by the more militant Colonel Abdul Nasser, Stalin agreed to supply Egypt with Czechoslovakian weapons) and Cuba (the vz. 52/57 was supposedly favored by Communist revolutionary and totalitarian thug Che Guevara over the more prevalent and inexpensive AK-47). It is believed that many of the vz. 52/57's presently in the US came in as dufflebag "bring backs" by troops returning from the US invasion of Grenada in 1983. While this is only a guess, it is not without basis; it is unlikely that Cold War-era Czechoslovakia would have exported any of these rifles to the US before the 1968 Gun Control Act became law, requiring import marks on all future imported firearms. This particular example has all matching numbers, and like all other examples the author has observed, has no import marks. The barrel is threaded with a thread protector held in place by a protrusion of the front sight hood. It is not known what type of device these threads were meant to accomodate. Note the integral bayonet, folded against the right side of the rifle. The MAS 36 bolt action rifle was developed by the Manufacture D'Armes de Saint-Etienne and officially adopted in 1936. It saw active use through the mid-1960's, when the MAS 49/56 finally saw uniform distribution throughout the French military. The MAS 36 is one of the few 20th century military rifles that completely lacks a manual safety. This particular rifle (serial number N 503XX) was made in the late 1940's. It is marked "MAS 1947-SC" on the barrel, indicating the barrel was made in 1947 (and possibly also indicating manufacture from steel provided by Schneider-Canet et Cie en Creusot). The finish is parkerized. A cruciform bayonet is in the tube underneath the barrel, which also doubles as a mount for the bayonet. Non-matching, import-marked. 275,240 of these rifles were manufactured between 1957 and 1978. This particular rifle (serial number G618XX, placing it right in middle of total production; the bolt is marked DN 72, perhaps indicating manufacture date in 1972) is marked "MAS 1983-MLN" on the barrel, indicating the barrel was made in 1983 (the significance of the MLN code is currently unknown) and is thus newer than the rifle. The finish is parkerized, and the rifle is import-marked. A squared "P86" marking may indicate it was rearsenaled in 1986. This rifle is fitted with a muzzle brake, and the barrel is ringed with cannelures which accomodate a spring-loaded ring. The ring limits how far a grenade can be placed onto the barrel, and thus controls the distance a grenade can be launched. Note also the grenade launcher sight on the barrel; to flip this sight up for use, a gas cutoff switch must first be moved out of the way, thus ensuring the rifle is in single-shot mode before any grenades are launched. The barrel on the MAS 49/56 is 5.5mm shorter than that of the MAS 49, and the stock has additional lightening cuts along with two ventillation holes to help cool the barrel. The MAS 49/56 semi-automatic rifle works by direct gas impingement, and was used extensively by the French Foreign Legion. MAS 49/56 rifles were used at the Battle of Bizerte in Tunisia. This beautifully-appointed rifle was purchased by Nepal circa 1870, probably for use by the King's Household Cavalry. The barrel is marked "J. C. & A. Lord, London, Birmingham, & Bombay." According to research done by Rob Whittaker, this long-established East India merchant was based near the metal trades quarter in Birmingham. Originally the firm was known as J. Lord & Co., and by 1850 was located at Friday Bridge. By the 1860's the firm was trading as J. C. & A. Lord, and located at 69 Newhall Street. By the close of the 19th century, the name had been changed to J.C. & W. Lord. Needless to say, this company was just the reseller, and not the manufacturer; this trade name likewise appears on a variety of 19th century hard goods including whale oil lanterns. In any case, the rifle does have British proof marks, and thus is of British manufacture. This specimen spent the 20th century in the Lagan Silekhana Palace in Kathmandu, and was imported to the United States in 2003. For more photos of this rifle, click here! This rifle was built in 1878 (serial number AC49XX), and after 16 years of British service, was one of 6,000 rifles gifted to Nepal in 1894. The rifle was reconditioned at the Allahabad arsenal in northeastern India and transported by caravan into the mountains of Nepal. The rifle then spent over a century in Kathmandu, until rescued from the Lagan Silekhana Palace in 2003. The barrel is dated June 1878. For more photos of this rifle and its accessories, click here! This rifle was built in 1917 (serial number 752XX) by BSA. It has a matching stock cap, but non-matching bolt. At some point in its service life, it was rearsenaled; this probably took place in India, given the presence of a crossbolt in the stock. Some very elegant wood repairs were also performed. No import marks are present. This rifle was built in August 1949 (serial number PF1311XX) at Fazakerly. This is a very early Mark II (one of the first 50,000 or so made), and thus has a walnut stock. This a rarity; the vast majority of Mark II's were made with light-colored birch or beech stocks. 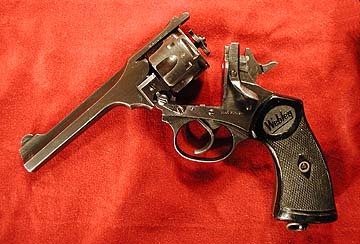 The Mark II had its trigger suspended from the action body (note the through the stock, above the trigger) instead of the trigger guard as in the No. 4 Mark I. This modification made the rifle more resilient to stock warpage, as otherwise the trigger group could potentially move in relation to the rest of the action. All matching numbers. Import marks are present. This rifle was built in 1945 (serial number BB19XX) by BSA, and was one of the first 2,000 (of a total of 81,329) No. 5 Mk. 1 rifles built there. The so-called "Jungle Carbine" was designed for action in the jungles of Malaysia and Indonesia, and as such had shorter barrel with a funnel-style flash hider (necessitating a special bayonet with a very large ring), and was significantly lighter than the No. 4 rifle. In fact, the No. 5 rifle weighed nearly two pounds less than the No. 4 rifle, due to lightening of the receiver knox, shortening of the barrel and stock, and hollowing out of the bolt handle. The lesser weight had the consequence of greater recoil, and thus the No. 5 rifle was also fitted with a rubber buttpad. A total of 251,136 No. 5 rifles were made during 1945, 1946, and 1947. This particular rifle is stamped "FMP" on the wrist strap, believed to be a Federated Malay Police marking indicating post-war use by said organization. This rifle has matching numbers, and is import marked. This futuristic weapon was built for riot control in Egypt during the early 1940's (serial number 417XX) by W. W. Greener of England. The shotgun was based on an improved Martini action, and was specifically designed to equip the Egyptian Ghafir police force with a weapon that would become useless if it fell into the wrong hands! Production of the earlier Mk. I and Mk. II Egyptian shotguns (13 and 14 gauge, respectively) began in 1922, with the intent that a criminal who bribed a police officer for his weapon would quickly run out of ammunition in these two obscure calibers. This worked reasonably well until the early 1930's, when enterprising bandits realized they could wrap a standard 16 gauge shell in tape and get it to fire. This practice was somewhat hazardous to the shooter, and one murderer was injured by the resulting blowback of his improvised cartridge which revealed the trick to the Egyptian authorities. The Mk. III was the result of further design changes designed to remedy this situation. First, the Mk. III chamber and Mk. III cartridge were bottlenecked, making the tape-wrapping work-around much more difficult. But that wasn't the most interesting design change: the firing pin of the Mk. III is shaped like a fork with three prongs, the outer two being longer than the center prong which contacts the primer. To complement this arrangement, the face of the Mk. III round has an annular groove encircling the primer, such that the two outer prongs of the firing pin are accomodated and the center prong may then strike the primer. Barring accomodation of the outer prongs of the firing pin, the shotgun will not even close on the round. Even if a conventional shotgun round was somehow forced to chamber, the contact surface of the firing pin would never be able to reach the primer, thus rendering the weapon useless. According to The Greener Story, just under 60,000 total Mark I, II, and III shotguns were made 1922 through 1964. 44,000 of these went to Egypt (serial numbers 1001 through 45000), and the subsequent 15,846 went to colonial police forces and prison services in such far-flung places as the Bahamas, Bechuanaland, British Guiana, Brunei, Ceylon, Cyprus, Fiji, Ghana, Grenada, Hong Kong, Jamaica, Kenya, Malaya, Nigeria, Northern Rhodesia, Nyasaland, Penang, the Seychelles, Sierra Leone, Singapore, Somaliland, Southern Rhodesia, Sudan, Tanganyika, Tanzania, Turks & Caicos, Uganda, Zambia, and Zanzibar. According to Bayonets from Janzen's Notebook, a bayonet was manufactured for these shotguns. The bayonet was essentially a modified Remington Egyptian M1867 Remington rolling block bayonet, since the Egyptians had many of these on hand. 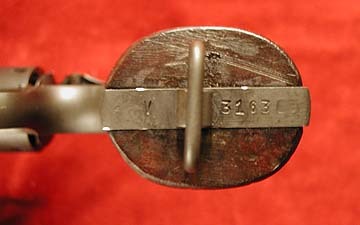 The bayonet is curved, and some are marked "EPOL". At least two variants of the Mk. III shotgun have been observed. The first variant, which is much less common, has a brass buttplate much like that of an Enfield rifle. The second variant has an iron buttplate. It remains unclear whether the iron buttplate models were originlly shipped that way, or perhaps the iron was just a replacement for a brass buttplate which was melted down during a time of desperation. The buttstock of both variants includes a compartment for storing a pull-through cleaning device. 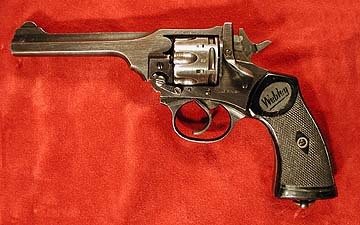 Serial number C59XX, this revolver was manufactured by Albion Motors (a bus and truck company in Glasgow, Scotland!) in 1943. A F/3/B Birmingham Proof House view mark on the revolver indicates it was proofed 1955, and thus probably sold to the private sector as surplus that year. 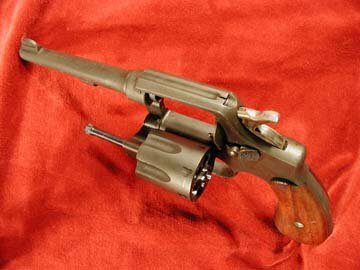 The revolver has its original phosphate finish, and a very tight action. Note the grooved plastic grips with a brass disc on right side (marked with the broad arrow acceptance mark in front, and the Albion Motors emblem on the reverse). It came with a worn Canadian-marked web-holster with brass cleaning-rod. All numbers match, and the revolver is not import marked (except for ENGLAND on right side). Albion Motor Works of Glasgow, Scotland, produced buses and lorries until called into service for the war, and didn't make many revolvers. Such revolvers are thus relatively scarce. Manufactured in 1943, this piece has a "WAR FINISH" stamp applied by Webley, intended to reassure potential customers that the low quality of finish was simply a wartime expedient, and not a reflection on Webley's quality as a whole. 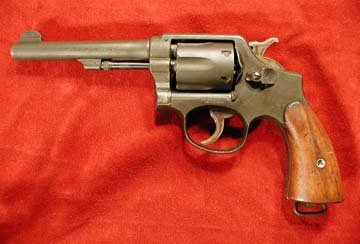 One of the more crudely finished British wartime revolvers I've seen; not a single surface is free of milling marks, and the whole thing is reminiscent of a 1945 "last ditch" German firearm. Not import marked. This rifle (serial number 247XX) was part of a large rifle contract fulfilled by Fabrique Nationale in Belgium. A great many of the individual parts have Lithuanian markings indicating individual inspection, owing to Lithuanian Army personnel stationed at the FN factory to oversee quality control. It was probably captured by Germany during World War II, then given to Romania. After World War II, it remained in Romania, until it was imported into the US (along with two other Lithuanian rifles) mixed in with a large batch of German 98K rifles. The barrel is matching, but the bolt is not (it has an E prefix serial number). For more information about this and other historic Lithuanian firearms, click here! This Mosin Nagant rifle, a.k.a. Vintovka Mosina (Mosin's Rifle), a.k.a. Trechlineynaja Vintovka Obraztsa 1891 Goda (Three Line Rifle, System of 1891), was manufactured by Westinghouse of New England, USA (serial number 4527XX). Russia was caught off-guard by World War I, and contracted with Westinghouse and Remington to make up for their lack of rifles in stock. When the Russian revolution occurred in 1917, Russia defaulted on its remaining orders. Fortunately, the US government bailed out the two companies by purchasing remaining stock (and as a result, there are US-marked MN1891 rifles). This rifle is non-matching, and import-marked. It still has a Russian Imperial crest on the receiver; most of these were defaced during Russia's 1917 revolution and subsequent descent into Communism. 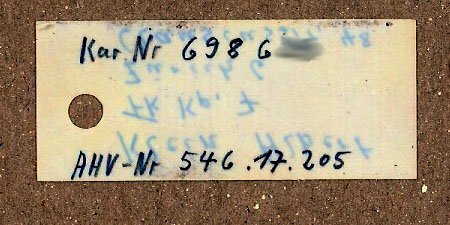 This particular specimen has Finnish property marks, and was likely in Finland when it became independent in 1917, thus escaping Communist vandalism. The rifle is dated 1915, but the 1915 date was applied by Westinghouse during all three years of production. This MN 1938 carbine (serial number KT29XX) was manufactured by Izhevsk in 1943. The electropencilled numbers matched. One can see even from this photo some of the wartime expediency with which this rifle was built (often called "first ditch" Russian arms given the early stage of the war, in contrast to Japan's "last ditch" hastily built arms of 1945). Note, for example, the lack of metal sling eyelets in the sling slots in the stock. This specimen is import-marked. This MN 1944 carbine (serial number GL16XX) was manufactured by Izhevsk in 1948. Note the folding cruciform bayonet folded against the right side of the carbine. Allegedly, these carbines were designed and balanced to be fired with the bayonet extended. This specimen has matching numbers, and is import-marked. The MN1891/59 carbine is a mysterious weapon indeed. Most simply, an MN1891/59 is an MN1891/30 rifle that has been shortened to carbine length, and its rear sight numbers partially ground off to reflect its reduced range. But who created these carbines, and how many were made, remains unknown. The "1891/59" marking on the receiver suggests the carbines were created in or after 1959. It was initially thought that Bulgaria or another Soviet satellite country performed the conversions in preparation for a western invasion that never came. However, some more recent evidence suggests that perhaps the USSR created the carbines. Interestingly, at least one of these rifles came home as a war trophy from the Vietnam War. This particular carbine (serial number 1809XX) was started life as an MN 1891/30 rifle built by Izhevsk in 1937. All numbers match, and the carbine is import-marked. This SVT1940 (Samozaryadnaya Vintovka Tokareva 1940) was manufactured in 1940 (its first year of manufacture) by Tula. Serial number AZh 34XX. Non-matching bolt and magazine (the latter with Finnish SA property mark). It is not known who added the extra sling swivel band (midway down the handguard, it is marked with an R; it seems to be a Remington-made 1903A3 band and swivel). Not import-marked. The Tokarev rifle is perhaps analogous to the US M1941 Johnson rifle, another semi-automatic rifle of World War II. 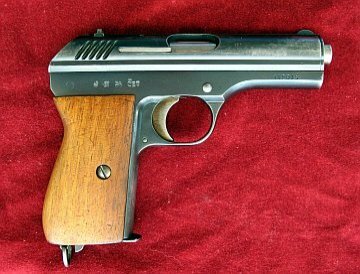 The Tokarev, like the Johnson, was considered too costly to manufacture, and was discontinued in favor of the cheaper-to-make SKS (or in the case of the Johnson, was discontinued in favor of the M1 Garand). About 18,000 of these gas-operated semiautomatic carbines were manufactured at the Umgramsh Factory from 1967 through 1979. It is believed that fewer than 6,000 survived destruction during the UN-led disarming initiative after the Balkan wars. Albania itself was an isolated western bastion of Maoism, and thus at odds with its Soviet-influenced neighbors. By 1961, relations were completely broken off with the USSR and other Warsaw Pact nations, leaving China as Albania's only ally. By 1978, even China had cut off aid (perhaps explaining why manufacture of these rifles ceased?) Albania's SKS rifle was as distinctive as its politics. The Albanian SKS has a longer handguard than most SKS's, an AK-style charging handle, a buttplate with two trapdoors instead of one, a Y shaped folding spike bayonet instead of the more traditional X shaped cruciform, a differently-contoured magazine other SKS's, and a sling swivel on the left side of the buttstock. To this day, it remains unclear why Albania adopted the older and more expensive SKS design over that of the AK. The Albanians called their SKS the "July 10th" Rifle, named after the anniversary of the centralization of the Albanian National Liberation Army in 1942 to fend off fascist Italy. This SKS (Samozariadnyia Karabina Simonova, or Simonov Self-loading Carbine) was manufactured in 1978 (serial number 031XX-78). The stock seems to be made of beech covered with an orange shellac. All numbers match, and the carbine is import-marked. The rifle came with a sling which is marked "(Chinese numerals)562 (Arabic numerals)7.62 (Chinese characters)Sen Fung Chun Bei Dai". 562 is likely the factory code. 7.62 obviously refers to the rifle. Sen Fung means literally "God mountaintop", which translates roughly to "sharp shooter" and likely is the sling model name. Finally, Chun Bei Dai means "gun back strap", or more concisely, "sling". The Chinese origin of this sling underscores the Albanian-Chinese relationship discussed above. This 98k rifle (serial number 52XXW) has a "dot 1944" code on the receiver indicating manufacture at Brno, Czechoslovakia in 1944 for the German Army. In 1944 or 1945, the gun was captured by the Russians who rearsenaled it, giving it a coat of red shellac and bluing the metal surfaces to the point of non-reflective blackness. Allegedly this change in finish was to make the weapon more tactically suited. The Russians discarded the cleaning rod (evidently, there were three different sizes of 98K cleaning rods, and use of the wrong one could cause barrel damage; as a result, it is believed that the Russians melted the rods for scrap). Additionally, the Russians removed the sight hood (perhaps to simplify simultaneous training of soldiers on German rifles and Mosin Nagants), and the trigger group guard screws (understandably, as they're not really that essential). At some point (perhaps in 1944 or 1945, or perhaps as the Cold War was winding down) the rifle ended up in the Ukraine. It then spent five years in Germany, before being imported to the United States in late 2002. This rifle has several Nazi acceptance marks, and the buttstock has numerous older German Weimar cartouches (behind the bolt takdown washer on the right side, and behind the triggerguard on the bottom). It also has force-matched electropencilled numbers (so marked by the Russians), and is import-marked. Manufactured circa 1905 by Husqvarna of later chainsaw and motorcycle fame. All matching numbers. Note the Swedish property number behind the cylinder on the right side. Not import-marked. Manufactured in 1907 (serial number 2030XX) at the Carl Gustaf Factory. All matching numbers. Import-marked. Inspector's initials "R.L." appear to the left of the serial number. Manufactured in 1942 (serial number 6554XX) at the Husqvarna factory. All matching numbers. Import-marked. Inspector's initials GB on rear sight. Note the threaded barrel on this rifle. The threads were a provision for a training device which could be turned on to the barrel. 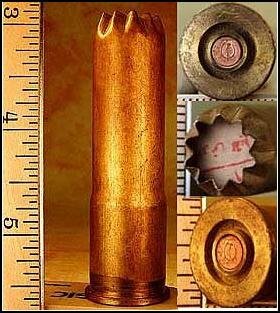 Rather than fire blanks, the Swedish used wooden bullets which, when the hit the device at the end of the barrel, were shredded into sawdust by blades within the device. The sawdust would exist the device via the holes in the sides. Manufactured in 1942 (serial number 184XX), its first year of manufacture at the Carl Gustaf Factory in Eskilstuna and converted in the 1950's to the AG42B configuration. Allegedly only about 33,000 of these semi-automatic rifles were made. The B configuration indicates a mid-1950's upgrade including the addition of an extra catch on the magazine, a rubber case deflector and hemispherical knobs on the bolt cover, an improved double-coil recoil spring, a sturdier cleaning rod, improvements to the rear sight elevation knob, trigger, and extractor, and the addition of a stainless steel gas cylinder which offered better rust resistance. This particular rifle has all-matching numbers (the serial number on the dust cover is electro-pencilled because this part was hardened, and any stamped numbers would have had to be added before the heat treatment), and is import-marked. Like the MAS 49/56, this semi-automatic rifle works by direct gas impingement. Sweden sold the equipment and specifications for making this rifle to the Egypt, where a licensed copy known as the Hakim was manufactured. This rifle (serial number ٢١٩XX, or 219XX) was manufactured in 1960 (receiver is marked ١٩٦٠) at Helwan. The buttplate appears to be non-matching. This specimen is import-marked. Sweden sold its AG42 tooling and engineering specifications to Egypt, which produced a licensed copy of the AG42 called the Hakim. Supposedly, what made the design to appealing to the Egyptians was how tolerant the design was of sand in the action. Supposedly 70,000 Hakim rifles were manufactured during the 1950's and 1960's. The Hakim rifle was used by Egyptians in the Suez Crisis (a.k.a. the Sinai War) of 1956-7. Caliber: While the AG42 was chambered in 6.5x55mm, the Hakim was chambered in 8mm Mauser. This was most likely done to make use of the large stash of German 8mm Mauser ammunition left over in North Africa from World War II. Clip guide: The clip guide on the Hakim is much longer than that of the AG42, as if intended to accomodate some kind of sighting device in the rear of the guide. Bayonet: The AG42 uses a hollow-handled (to fit over the cleaning rod), all-metal Swedish Mauser bayonet which is light and easy to manufacture. The Hakim used the slightly more traditional, heavy, and dare I say, stylish, wooden-handled bayonet. These two bayonets will not interchange! Serial number 174XXX, this M78 rifle was manufactured by Waffenfabrik Bern circa 1879. All matching numbers. Wood has original finish. Not import marked. The Vetterli was one of the first bolt action repeating rifles. It fired a 310 grain projectile at approximately 1425 fps. Between 55,000 and 100,000 Vetterli M.78's were manufactured between 1878 and 1881. It was the first repeating rifle widely adopted for military service, and could be fired as many as 21 times a minute. This particular model holds 13 rounds (12 in a tubular magazine, and 1 in the cartridge elevator). Good luck finding 13 10.4x38mm Swiss rimfire rounds at your local sporting goods emporium! Serial number 1547XX, this rifle was manufactured by Eidgenoessische Waffenfabrik in Bern circa 1893. About 212,000 of these rifles were made there between 1891 and 1897. The M1889 was a very advanced rifle for its time, featuring a removable magazine which held 12 rounds. It is interesting to note that the bayonet for the U.S. Krag rifle was based on the bayonet for the Model 1889. This rifle has all matching numbers. Wood has original finish. The rifle has a P.33 marking, indicating it was sold to a soldier in 1933. This rifle was imported from Switzerland in 2004. Serial number 6986XX, this rifle was manufactured by Waffenfabrik Bern in 1942. All-matching numbers. Wood is fiddleback walnut and retains its original finish with a small (1" x 1 1/2") arsenal repair to left side by tang. Included aluminum muzzle-cap. The bottom images are the two sides of the tag found underneath the buttplate. Sadly, attempts to contact Mr. Klein by mail were unsuccessful. The "Fk" abbreviation could be short for "Flak" (Anti-Aircraft Gunners) or alternatively, "Funker" (Radio Corps), indicating the job Mr. Klein held in the Swiss Army. A great resource for decoding Swiss rifle buttplate tags can be found here. The author of this page can be reached at webmaster-at-freeexistence.org. Replace "-at-" with "@" in the "To:" line. Reminder: All content on this site is automatically copyrighted by virtue of the Berne Convention for the Protection of Literary and Artistic Works.